Which DJ software does the Mixtrack Pro 3 come shipped with? The Numark Mixtrack Pro 3 comes shipped with Serato DJ Intro. 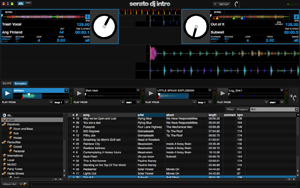 As an option, users can also use Serato DJ 1.7.5 and up with their Mixtrack Pro 3. However, Serato DJ is not free and must be purchased or previously activated. What are the size of the platters for the Mixtrack Pro 3? 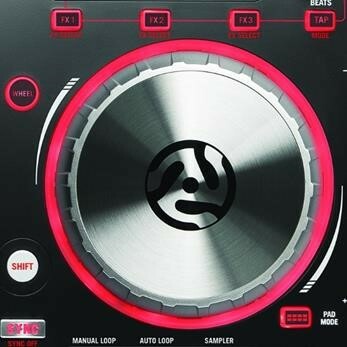 The Numark Mixtrack Pro 3 platters are identical to the Numark NV platters in terms of size. They are 5-inch hyper-responsive metal platters with search and scratch modes. This capacitive, touch-sensitive jog wheel controls the audio when the wheel is touched and moved. When the Wheel button is not active, use the jog wheel to bend the pitch of the track. When the Wheel button is active, use the jog wheel to grab and move the audio, "scratching" the track as you would with a vinyl record. You can also grab the non-touch-sensitive outer wheel to bend the pitch of the track. What does the Touch Strip do on the Mixtrack Pro 3? The Touch Strip is a multi-function Touch Strip which is used for dynamic FX control, multi FX and Track Search. You can use the Touch Strip to adjust the assigned FX. Hold Shift + Strip Search to search through a track’s time. What do the FX buttons 1, 2, and 3 do? FX 1 On/Off: Turns FX1 on and off. Hold Shift + FX1 to select from the list of available effects in the software. FX 2 On/Off: Turns FX2 on and off. Hold Shift + FX2 to select from the list of available effects in the software. FX 3 On/Off: Turns FX3 on and off. Hold Shift + FX3 to select from the list of available effects in the software. 21.6" x 9.1" x 1.1"
What do the filter knobs do on the Mixtrack Pro 3? The filter knobs affect the LPF (Low Pass Filter) when turned to the left and the HPF (High Pass Filter) when turned to the right. The high pass filter is useful for getting rid of unwanted low frequencies in your mix and the low pass filter is used for eliminating unwanted high frequencies. How long are the pitch sliders on the Mixtrack Pro 3? The pitch sliders are 100mm (most competition at this price point are 60mm only). Does the Mixtrack Pro 3 have LED meters? Yes, the Mixtrack Pro 3 features ultra bright LED volume meters. Are the Prime Loops and TOOLROOM packs "light" versions? Can I scratch on these 5 inch platters? Absolutely. In fact some people like the smaller jog wheels. They say since the they are smaller, they have less mass, they can move much more quickly and feel more responsive. Here’s a short NV video of scratching on 5 inch platters (which is the same as the MTP3) click here. What is the Mixtrack Pro 3 made of? The Mixtrack Pro 3 is made out of high impact polymer composite which provides strength durability as well as making it light weight. Are the performance pads velocity sensitive? No. The pads are not velocity sensitive. How do you change the pads modes on the Mixtrack Pro 3? The upper row of pads has different functions depending on their mode: Manual Loop Mode, Auto Loop Mode, and Sample Mode. To select a mode, hold down the Pad Mode button and press one of the upper pads. An LED under the pad section indicates the currently selected mode. Loop In – Sets the beginning of a loop. After a Loop Out point is set, when this button is pressed again, it will allow for fine adjustment of the Loop In point. Loop Out – Sets the end point for the loop. When this button has been pressed after a Loop Out point has been set, it will allow for fine adjustment of the Loop Out point. On/Off – When this is pressed inside a loop, this will turn the loop off. When pressed outside a loop, this will activate the loop and start playback from its Loop In point. If a loop has not been set, this button will have no effect. Loop x1/2 – Cuts the currently playing loop in half. Press Shift + Loop x1/2 to double the length the currently playing loop. Auto 1 – Sets and starts playback of a 1-beat autoloop. Auto 2 – Sets and starts playback of a 2-beat autoloop. Auto 4 – Sets and starts playback of a 4-beat autoloop. Auto 8 – Sets and starts playback of an 8-beat autoloop. Sample 1 – Plays the sample assigned to Sample Pad 1. Sample 2 – Plays the sample assigned to Sample Pad 2. Sample 3 – Plays the sample assigned to Sample Pad 3. Sample 4 – Plays the sample assigned to Sample Pad 4. Do you have to install any additional drivers for the Mixtrack Pro 3? No. The Mixtrack Pro 3 is a class compliant device so there are no additional drivers to install. The DJ controller is both Mac and PC supported. Does the Mixtrack Pro 3 work with Virtual DJ, Traktor and other DJ programs? Since Mixtrack Pro 3’s hardware controls appear to your computer as a generic MIDI device, it can indeed be custom-mapped to any other DJ application that supports user or developer-created custom mapping. Will there be any cases/bags available? Whether you are a customer or dealer, if you already own a Numark product, or if you just have pre-sales questions, the Numark technical support team is available to help! Visit the link below to connect with any of the following support options: online community support, phone support, email support.